The Komondor is built for livestock guarding. It is big, strong, and armoured with a thick coat. The coat provides protection against wild animals and the weather and vegetation, the coat of the dog looks similar to that of a sheep so it can easily blend into a flock and camouflage itself giving it an advantage when predators such as wolves attack. The coat is the trademark of the breed. 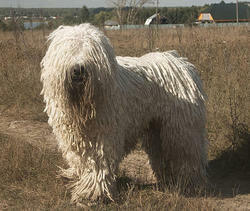 The Komondor was mentioned for the first time in 1544 in a Hungarian codex. The Komondor breed has been declared one of Hungary's national treasures, to be preserved and protected from modification. The Komondor is a large dog (many are over 30 Inches (76 cm) tall), making this one of the largest common breeds of dog. The body is covered by a heavy, matted, corded coat. The dogs have robust bodies, strongly muscled, with long legs and a short back, with the tails carried low. The body, seen sideways, forms a prone rectangle. The length of body is slightly longer than the height at the withers, approximately 104% of the height at withers. The Komondor has a broad head with the muzzle slightly shorter than half of the length of the head, with an even and complete scissor bite. Nose and lips are always black. The minimum height of female Komondors is 25.5 inches (65 cm) at the withers, with an average height of 27.5 inches (70 cm). The minimum height of male Komondors is 27.5 inches (70 cm) with an average height of 31.5 inches (80 cm). No upper height limit is given. Komondor females on average weigh between 88-110 lb (40-50 kg) and Komondor males weigh on average between 110-132 lb (50-60 kg). The Komondor is calm and steady when things are normal, but in case of trouble, the dog will fearlessly defend its charges. It was bred to think and act independently and make decisions on his own. It is affectionate with its family and gentle with the children and friends of the family. Although wary of strangers, they can accept them when it is clear that no harm is meant, but is instinctively very protective of its family, home and possessions. The Komondor is good with other family pets but is intolerant to trespassers and teasing, and is not a good dog for city life. The dog is vigilant, will rest in the daytime, keeping an eye on the surroundings, but at night is constantly moving, patrolling the place, moving up and down around the whole area. The dogs usually knock down intruders and keep them down until the owner arrives. Due to the Komondor's size, power, speed and temperament obedience training should start from a young age (4 - 8 months. A Komondor can become obstinate when bored, so it is imperative that training sessions be upbeat and happy. Praise is a must, as are consistent and humane corrections. Once a Komondor gets away with unfriendly or hostile behaviour, it will always think such behaviour is appropriate. Therefore, consistent corrections even with a young puppy are necessary to ensure a well-adjusted adult. Socialization is also extremely important. The Komondor should be exposed to new situations, people and other dogs as a puppy. Because it is a natural guard dog, a Komondor that is not properly socialized may react in an excessively aggressive manner when confronted with a new situation or person. The Komondor's coat is a long, thick, strikingly corded white coat, about 20 - 27 cm long (the heaviest amount of fur in the canine world), which resembles dreadlocks or a mop. The puppy coat is soft and fluffy. However, the coat is wavy and tends to curl as the puppy matures. A fully mature coat is formed naturally from the soft undercoat and the coarser outer coat combining to form tassels, or cords and will take around two years to form. Some help is needed in separating the cords so the dog does not turn into one large matted mess. The length of the cords increases with time as the coat grows. Shedding is very minimal with this breed, contrary to what one might think (once cords are fully formed). The only substantial shedding occurs as a puppy before the dreadlocks fully form. The Komondor is born with only a white coat, unlike the similar-looking Puli, which can be white, black, or sometimes greyish. However, a working Komondor's coat may be discoloured by the elements, and may appear off-white if not washed regularly. Traditionally the coat protected the Komondor from wolves' bites, as the bites were not able to penetrate the thick coat. The coat of the Komondor takes about two and a half days to dry after a bath. Komondors do not suffer many hereditary problems. Perhaps because the breed has descended from centuries of hardy working stock, Komondors have few genetically linked problems. In particular, there is no evidence of the retinal eye problems found in other breeds, nor is there dwarfism or hereditary blood disorders. As in all large breeds (and some small ones) there is some hip dysplasia. There are two eye disorders found in the breed. Entropion is indicated by the curling inwards of either the upper or lower eyelid. This lid deformity causes the lashes to rub against the cornea causing lacerations and infections. More recently, juvenile cataracts have been documented. There is some indication of bloat, a life-threatening condition. The incidence of bloat is no greater than with any other large breeds. To possibly help to avoid bloat do not feed soon before or after any exercise. External parasites can be a problem due to the heavy coat. As with any long-haired dog, a skin check should be part of a regular grooming routine. If fleas or ticks are found, aggressive measures are in order. Shampoos and powders work well, but great care should be observed as it is easy to miss a spot where the fleas can hide. Owners should check anti-flea and tick preparations carefully as the Komondor can be extremely sensitive to some of these products. It is recommended to spot-test the coat before dipping as some flea dips have been known to discolour the white coat. Ear care should also be routine. As Komondors have ears which prevent air circulation, it is especially necessary to keep them clean and hair-free. Some ear canals are more hairy than others, but commercial powders, cleansing fluids and plucking of the hair can greatly reduce infections. Thick hair grows between the pads of the feet which also require maintenance. This hair can pick up burrs, or become a source of irritation and infection when wet. For the health and comfort of the dog, this hair should be cut out with an electric clipper or scissors to keep mats from forming between the foot pads.